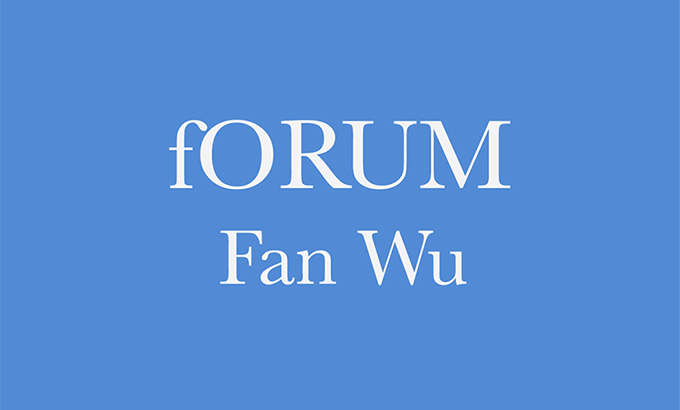 Mercer Union is delighted to announce that Fan Wu will be the next guest in our fORUM critical conversation series. Please join us on Wednesday 25 January at 7PM. Doors will open at 6:30. “I want us to have a conversation around a spectrum of self-conception that runs across two poles: becoming on one end, and identity on the other. Yet to begin to speak with an “I” is already a betrayal of queerness, which is the promise of flow and slippage from scene to scene, never being able to be pinned down, unbecoming and becoming seesawing in erratic ecstasy. Queerness rewrites the “I” into the sheer potential of the fragment & the momentary. Queerness is all well and good, as a sticky, dreamy ideal. But then one night, roaming the same sleaze-spilt bathhouses that gives me so much nervous pleasure, who sleeps with you in the pitch-darkness but your own father? Ancestral identity takes me from the playful darkness and affixes me to communist China, to the sacrifice of my parents’ childhoods to Maoist ideology. I am haunted by a passed-down phantom pain that dispossesses me of my queer fluidity. Fan Wu is a devoted dilettante and a student of Comparative Literature and Cinema Studies at the University of Toronto. He is liable to have a crush on at least one person in any given room, and his first chapbook of translations, Hoarfrost & Solace, was published in July 2016. He runs a series of close workshops on theory and poetics through various art galleries in Toronto.